Today is Pearl Harbor Day It’s hard to believe that 74 years have passed since a stealth attack by Japanese air and naval forces decimated our U.S. naval base at Oahu Island’s Pearl Harbor. 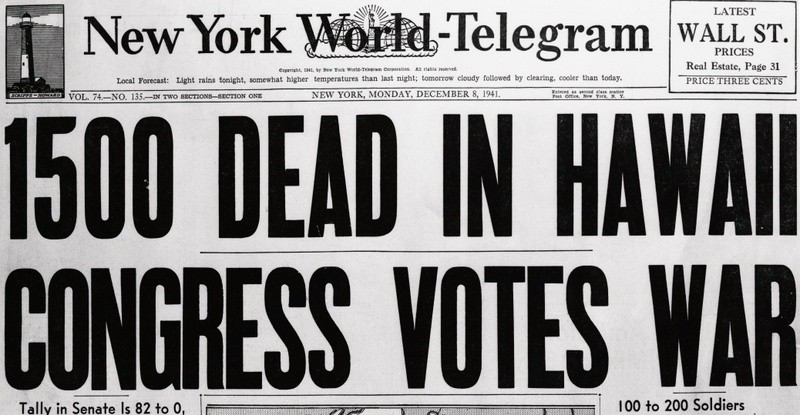 It was a day–December 7, 1941–that would forever be stained with the blood of the more than 2,500 Americans killed and 1,000 wounded. The assault lasted less than two hours. It was a day that President Franklin D. Roosevelt would define for the ages as “a date that will live in infamy” and led to our immediate entry into WWII. Our U.S. commitment to the Allied war effort took four years and cost us more than 400,000 American lives. Seventy four years later and we’re still facing insidious attacks on our citizenry, but this time, it’s closer to home–in our neighborhoods, our schools, our houses of worship, our workplaces, our cinemas and athletic events. While the perpetrators of these horrific attacks to date may have been compelled by a nebulous range of compulsions and allegiances, they all have one thing in common: access to weaponry designed strictly for the battlefield not the neighborhood playground. “All decent people feel sorrow and righteous fury about the latest slaughter of innocents, in California. Law enforcement and intelligence agencies are searching for motivations, including the vital question of how the murderers might have been connected to international terrorism. That is right and proper. “But motives do not matter to the dead in California, nor did they in Colorado, Oregon, South Carolina, Virginia, Connecticut and far too many other places. The attention and anger of Americans also should be directed at the elected leaders whose job is to keep us safe but who place a higher premium on the money and political power of an industry dedicated to profiting from the unfettered spread of ever more powerful firearms. “It is a moral outrage and a national disgrace that people can legally purchase weapons designed specifically to kill with brutal speed and efficiency. These are weapons of war, barely modified and deliberately marketed as tools of macho vigilantism and even insurrection. America’s elected leaders offer prayers for gun victims and then, callously and without fear of consequence, reject the most basic restrictions on weapons of mass killing, as they did on Thursday [12/3/15]. They distract us with arguments about the word terrorism. Let’s be clear: These spree killings are all, in their own ways, acts of terrorism. “Opponents of gun control are saying, as they do after every killing, that no law can unfailingly forestall a specific criminal. That is true. They are talking, many with sincerity, about the constitutional challenges to effective gun regulation. Those challenges exist. They point out that determined killers obtained weapons illegally in places like France, England and Norway that have strict gun laws. Yes, they did. “But at least those countries are trying. The United States is not. Worse, politicians abet would-be killers by creating gun markets for them, and voters allow those politicians to keep their jobs. It is past time to stop talking about halting the spread of firearms, and instead to reduce their numbers drastically–eliminating some large categories of weapons and ammunition. “It is not necessary to debate the peculiar wording of the Second Amendment. No right is unlimited and immune from reasonable regulation. “Certain kinds of weapons, like the slightly modified combat rifles used in California, and certain kinds of ammunition must be outlawed for civilian ownership. It is possible to define those guns in a clear and effective way and, yes, it would require Americans who own those kinds of weapons to give them up for the good of their fellow citizens. “What better time than during a presidential election to show, at long last, that our nation has retained its sense of decency?” –Editorial published on page 1 of The New York Times, Saturday, December 5, 2015, no author credited. Judith Trojan is an Award-winning journalist who has written and edited more than 1,000 film and TV reviews and celebrity profiles. This entry was posted in Newspapers, Publishing and tagged December 7 1941, Editorials, Franklin D. Roosevelt, Gun Control, Gun Regulation, Pearl Harbor, Second Amendment, The New York Times, U.S. History, U.S. Military. Bookmark the permalink. If every American in Hawaii had done his duty and added an anti-aircraft gun to his home arsenal, it would have been a different story.